Melrose Abbey in Scotland was established in 1136 for a community of Cistercian monks. The original buildings here were destroyed in the 13th century and so a new church had to be built. The new Abbey was built from pink sandstone and the walls were richly decorated. It took over 150 years to rebuild Melross Abbey in the 15th century and the changes in building styles are most obvious in the windows of the east and south transepts. 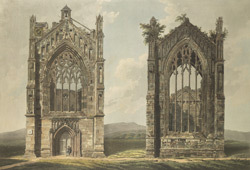 The window on the right of this print is from the east transept and demonstrates the trend for strong vertical lines fashionable in Gothic Perpendicular architecture. The window on the left has been designed in a more free French style.